There are a lot of peripheral devices out there being created to make the MōVI even more useful and versatile than it already is. I’ve tried a lot of them – the EasyRig with the FlowCine Serene arm, hands-free Segways, RC cars such as the Freefly Tero, to name just a few. But the one that seems to come out of my bag of tricks the most and has pretty much become part of my everyday kit is the Walter Klassen FX Slingshot. I met Walter Klassen and his team at CineGear LA 2014, where they introduced me to the Slingshot. At first, I was a bit turned off by the idea of adding a harness, poles, bulk to my sleek, compact MōVI shooting package. After all, the beauty of shooting with the MōVI is how small and moveable it is, why would I want to detract from this? And then I started to play with the Slingshot. All of a sudden, I realized the potential of this thing – jib moves, overheads, awkward angles – and I can walk while doing it. I’ve become a human techno crane. A reasonably comfortable harness has telescoping poles coming out of the back of it, two more poles extend from those, elastic bands extend the length of the top poles and hang in front of the operator. These bands have loops on their ends which then attach to the carbon fiber top bar of your MōVI. The Slingshot comes with a few sets of bands with varying elasticity to accommodate different camera package weight. The idea is that you select the right elasticity strength to match the weight of your camera package, ideally creating a sweet spot for your MōVI rig, where the bands take most of the weight of the MōVI and distribute the weight to the harness, making it easier to carry. 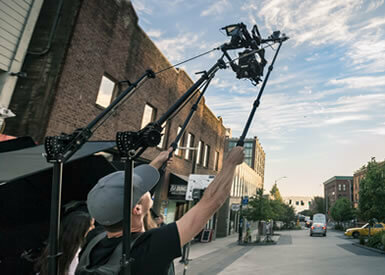 The elasticity also absorbs small vertical movements you make as you walk with the rig, thus removing some of the vertical translation from your footage (the MōVI stabilizes roll, pan, and tilt, but not vertical, horizontal or front-to-back movement). For its intended purpose of eliminating vertical movements, it works ok. If you match the elastic bands to your camera just right and don’t move too fast, you get pretty good results. But if you start moving quickly, the results get a bit funky. As more energy enters the elastic bands, the camera begins bouncing up and down with each fast, heavy step you take, essentially bringing the vertical movement back into the frame. If you get the bands really tight, that helps at super high speed, but it also seems to introduce horizontal movement into the frame at certain speeds. So it seems that in order to remove vertical translation with the Slingshot, you need to tune the system to not only the exact weight of your camera rig, but to the speed at which you’ll be moving as well. This works great for a long walk-and-talk shot that would burn up your arms otherwise, but for random, unplanned run-and-gun footage, the Slingshot seems to solve some problems and simultaneously create others. So let’s talk about where the Slingshot shines and blows minds. You can optionally purchase two carbon fiber monopods with clamps on the end that attach to the top bar of your MōVI. These allow you to push the MōVI away from you for the full length of the monopods, while the elastic bands hold onto the MōVI securely. Thus, you become a MōVI puppeteer, aka a moving technocrane. 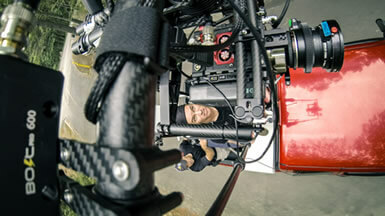 You can push the MōVI up, out, down, around, over and under your subject, into hard-to-reach spaces, and so on. You can strap yourself to the cab of a pickup truck or pursuit vehicle and become a small human Russian arm. The possibilities are endless and the results are nothing short of amazing. Quite literally, there is no other way to get these sorts of shots. As a camera operator, I’m constantly looking for ways to solve problems for my DP. That’s what makes the MōVI such a powerful tool and in some situations, the Klassen Slingshot solves a few problems as well, especially when it can replace a small jib or get the camera into a difficult to reach position. As a cinematographer, I’m constantly looking for unique ways to tell the story through interesting camera positions and movements and this is where the Klassen Slingshot really shines. When it comes to minimizing vertical movements with your MōVI, unfortunately there is no better way than to simply be a physically strong operator with good walking technique. 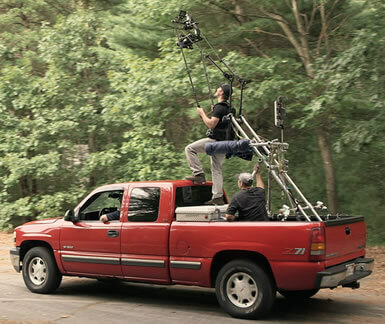 Yes, it is difficult to carry the MōVI fully rigged for cinema applications for a long shot with proper technique, but it is what it is. Train, lift weights on your off days, eat well, practice good breathing, get zen with it. But if you are looking for a few new powerful tricks to put into your camera-moving arsenal, the Walter Klassen FX Slingshot is an absolute must-have.